Lindsay Ell 2nd Annual CMA Fest Fan Party! 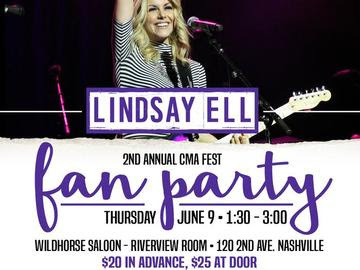 From Lindsay: Come out and hang at my 2nd Fan Club party at CMA Fest!! You'll be the first ones to get my brand new picture t-shirt we designed for this summer, as well an an acoustic performance and meet & greet. Can't wait to see you all!! Tickets $20 in Advance, $25 at Door are available here.